I think that you would have had to have tried to miss the trending hash-tag a week or so ago. I’m not certain that Twitter was prepared for the firestorm that they stirred with their action…whether or not they were, they certainly seemed to have not cared. Most serious users of Twitter, though, were outraged by what amounted to an assassination of third-party apps in their eco-system. The back-story here is this: Twitter announced a bit over a month ago that they were killing two core APIs that third party clients rely on for advanced functionality: live streaming, and push notifications. Their official explanation was that these were deprecated and running on an older stack that the company couldn’t afford to support any longer. Given Twitter’s obvious distaste for third party clients in the past few years, however, this smacks of a marketing spin. Live streaming I can sort of understand. Killing push notifications, however, is obviously an attempt to thin out the ecosystem and drive users to official apps. To really grasp the problem with this, let’s jump into the way-back machine to around 2009, which is when I released my first tweet to the world. I did so from the website, but it took me only a couple of days to settle on which application I preferred to use to access the social network. There were no official apps, then. Third party developers built the first Mac desktop clients, and later the first mobile clients. Twitter, in it’s beginning, was often used via SMS, as smartphones weren’t as ubiquitous as they are today. Anecdotally, the website accounted for very little of Twitter’s usage, yet it was wildly popular. This was something that we hadn’t seen before. Soon, Twitter was becoming a de-facto way in which to get breaking news and information. Twitter was where I first learned of Michael Jackson’s passing. The State Department at one point requested that Twitter delay maintenance that would have caused downtime because it was the only consistent source of real-time data during the Iranian elections. Twitter was sort of a big deal. For those of us who are serious users of Twitter (many developers are, as that tends to be the network where we hang out), which Twitter client you use is sort of an indicator of personality. Geeks love discussing this stuff. Experimenting with different Twitter clients was half the fun of using the network. In fact, long ago in a galaxy far away, the website used to include visible metadata indicating which client you used to post a given tweet. Twitter was aware of what it was and the place that it held then, both in the social network landscape, as well as the wider cultural narrative. Twitteriffic was the first Twitter client that I ever used, and ultimately was the one that I returned to. I experimented with various applications over the years, and used the official clients for a while. The issues just kept coming, though. Twitter’s native iOS client stopped supporting landscape on iPhones (anytime that happens, the app is basically dead to me….I’m incapable of typing in portrait). The timelines became more and more cluttered with sponsored tweets and ads, to the point that advertiser spam became more prevalent than my friends. Like another network that shall not be named, Twitter began to algorithmically surface tweets in our timelines, rather than letting us curate what we wanted. Features like lists are still there, but only power users take advantage of them. Then again, apparently only power users take advantage of third party applications, also. Compare this to apps like Twitterific, that provides many theme and presentation options, excludes ads and sponsored tweets, included a watch app (which Twitter discontinued because it claimed it couldn’t control the experience well enough, yet they offer an AppleTV app. Go figure). Why would Twitter choose to potentially lose serious users of it’s network by intentionally blocking these sorts of tools? It’s Because of the Money, Man! This doesn’t take much imagination. Twitter doesn’t care about the serious users, because the lowest common denominator of people who mindlessly consume their timelines see and click on sponsored tweets and ads, so they pay the bills. My guess is that they don’t interact with others as much…which is sort of the point of a social network…but they pay the bills. So any third party client that omits the money-maker has to be cut off. Well, that’s the conspiracy theory, at least. I think, though, that there’s a larger issue at play, a somewhat more innocent one: Twitter’s having an identity crisis. I imagine that, if you managed to interview the right people at Twitter, there would be discussion of how third party clients are not preferred because Twitter can’t control it’s brand this way. Visually, these apps are very different (which is part of their appeal) than Twitter’s design. So, if you insist on something adhering to a certain aesthetic, that would be a valid argument. At least it would if you were a platform or a product. Twitter is neither of these things, though. Twitter is a service, basically an endpoint that was always able to be consumed and interacted with however developers choose. The value in Twitter is in the interactions and information flow that it facilitated, as well as in the cool things that developers can do with the endpoint. At it’s inception, Twitter understood this, even accepted it (there’s a reason developers hang out there). Now, it appears, the marketers are in control and there’s a desperate scramble for cash. Twitter has lost it’s way. It doesn’t know what it is, or what place it holds, so it’s trying to be everything that it’s not, and wondering why everyone is unhappy. I completely understand that, as Twitter has grown and become solidified in our digital worlds, it has to pay the rent, as it were. That has to happen somehow (and it’s painful for me to say that…I’m the guy who uses ad-blockers in his browser). So, insisting that third party clients honor ad placements or sponsored tweets makes sense from that perspective. Why not embrace it and give third party developers the ability to offer users customizations to that effect (similar to how Apple handles native ads in iOS)? 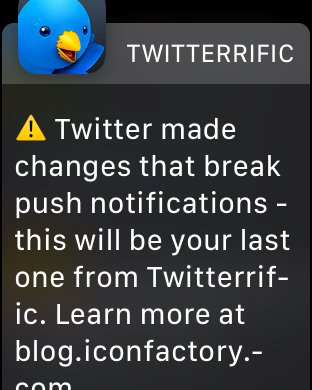 More importantly, open up the new API at a cost-effective rate so that developers of great apps like Tweebot and Twitterrific can realistically access push notifications. This is a much more important feature that Periscope or “moments,” which Twitter seems intent on pushing even though users seem to not want them. In the meantime, I am still using Twitterrific. As a workaround to the absence of push notifications, I went back, ironically, to Twitter’s roots and activated SMS notifications for follows, retweets, mentions and the like. I get those notifications on my devices the way that I want. Slightly clumsy, but it’s functional, and I would rather do that than use the official Twitter iOS app, if that tells you anything. I’m really, really sad at how exclusionary Twitter has become. I wonder if, between poor choices and fake news, we’re seeing the demise of the original social media giants. Maybe, maybe not. They will be around as long as they can pay the bills. The users who grew with them to their current status, though, won’t be if they keep their current trajectory. That is a sad state of affairs.